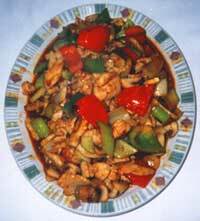 Szechuan chicken with marinade and seasoning sauce. Mix the ingredients in a bowl for the sauce. Place the peppers and 1 tablespoon of cooking oil in a wok. Brown the peppers under medium-high heat and remove them to a plate. Add the cubed chicken and cook until pink color disappears (2-5 min). Remove the chicken from the wok. Add 1 tablespoon of oil to the wok, and add the carrots. Stir-fry until carrots begin to soften. Add the bamboo shoots and stir-fry 1-2 minutes. Add the peppers, chicken, and the sauce to the wok. Stir over medium heat until the sauce thickens.